As Tesla is attempting to more than double its Model 3 production rate during this quarter, it has been expanding the range of deliveries outside of California. We now learn of another batch of Model 3 configuration invites as part of the expansion. During the first week of January, Tesla made its biggest expansion of Model 3 invites yet. We received reports from Model 3 reservation holders in New York, New Jersey, Maryland, Massachusetts, and Illinois who have received an invite from Tesla to configure and order their Model 3. Two weeks later, we are now receiving new reports of Model 3 reservation holders being able to configure their cars in Arizona, North Carolina, Minnesota, Wisconsin, and Ohio. Between those new invitations to configure and the previous batch from a few weeks ago, it looks like Model 3 is going almost nationwide. 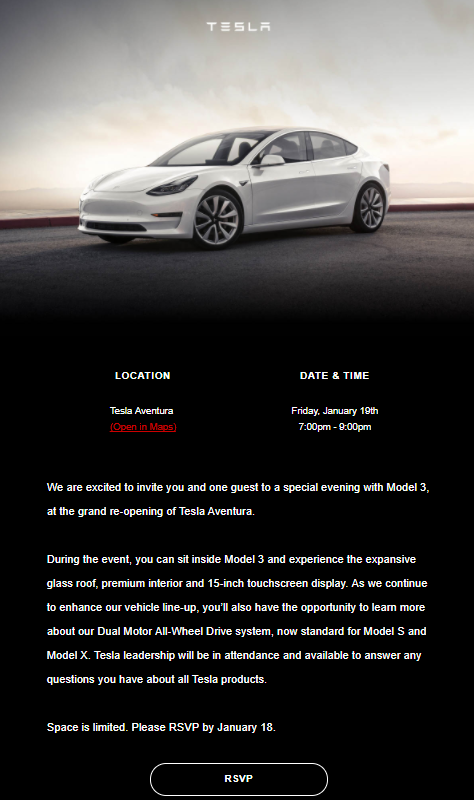 While it appears that the Model 3 is now available almost everywhere in the US, it also seems that the invites are still prioritized for current Tesla owners who reserved on the first day or so. As we reported last week, Tesla started adding Model 3 display cars to a few stores in California and announced that it will soon expand the fleet to new markets in order to give reservation holders an opportunity to see the car in person before ordering. Tesla said that they would send display cars by priority of markets where there’s already a high demand for the Model 3. Los Angeles and the Bay Area, where Tesla sent the two first cars, are two of Tesla’s biggest markets in the US and Florida is up there too. Another expansion of the availability of the Model 3 configurator is a good indicator that the production ramp is still going despite the recent delays in achieving the 5,000 units per week production rate. But it’s also important to note that the production delays also resulted in the production of the standard battery pack and non-premium package being delayed, which is resulting in the base price of the Model 3 still not coming close to its promised $35,000 sticker price. Therefore, some Model 3 reservation holders are likely waiting for those options to become available before going forward with their order, which is likely affecting the reservation order. It would be interesting to know how many reservation holders who are being invited to configure their Model 3 are deciding to wait for more options. Maybe it’s something that Tesla will talk about during its earnings conference call next month.